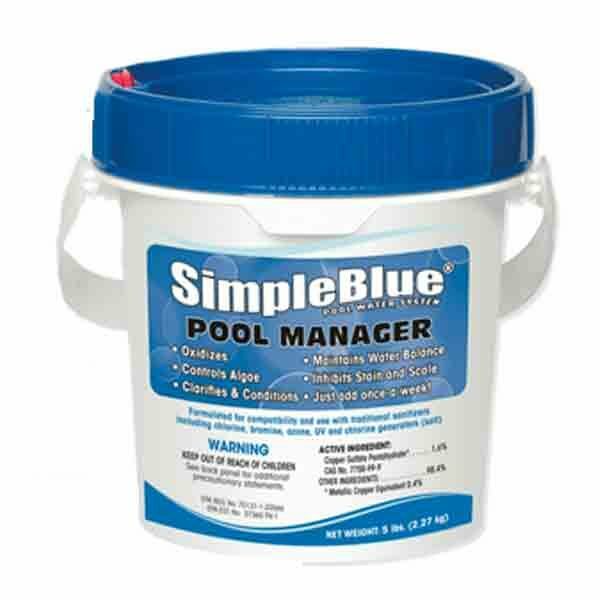 SIMPLE BLUE POOL WATER MANAGER is a water care program that combines simplicity with amazing water quality in a once-a-week application. REACTIVE basis after they occur. • Convenient and simple to use – just once-a-week! • Eliminates problems associated with harsh chemicals – no waiting to swim! Calcium Hardness 350 ppm (minimum) pH 7.2-7.6 Total Alkalinity 80-120 ppm STEP 2 – POOL WATER MANAGER DAY Add SIMPLE BLUE POOL WATER MANAGER to pool according to dosage chart, preferably near a return jet, and add POWER BOOST in accordance with product directions. STEP 3 – CLEAN FILTER 7-10 days after initial dose, clean filter thoroughly. Weekly: Repeat POOL WATER MANAGER DAY… just once-a-week! Monthly: Take a water sample to your SPARCO Authorized Dealer for testing. *Dosage may need to be increased or decreased based upon weather and usage. For chlorine generators (salt), balance pool water to SIMPLE BLUE parameters and add stabilizer to maintain 30-50 ppm based on manufacturer’s recommendation and adjust generator setting accordingly. 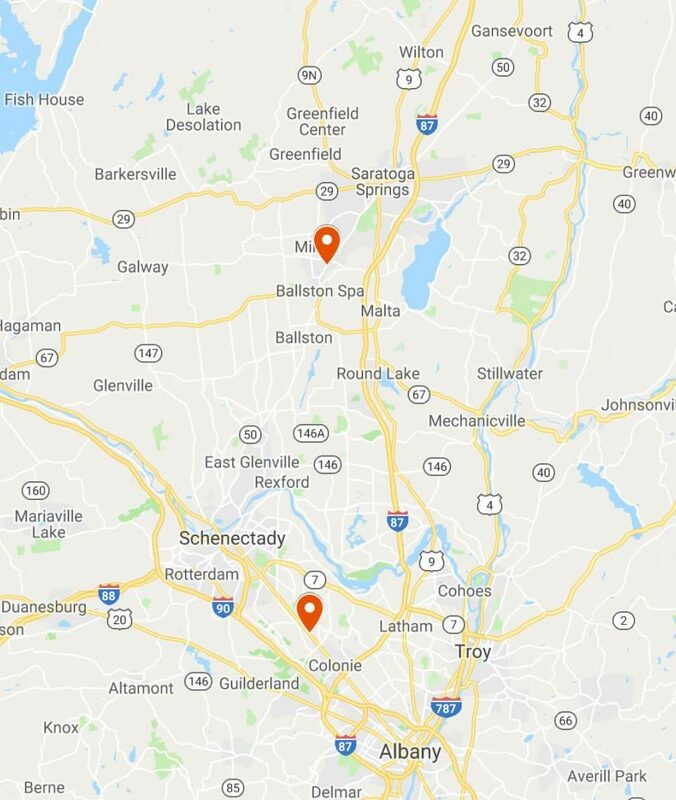 Salt, mineral and ozone pools use 50% dosage – see application charts. POWER BOOST (sanitizer) must be added in accordance with product directions. 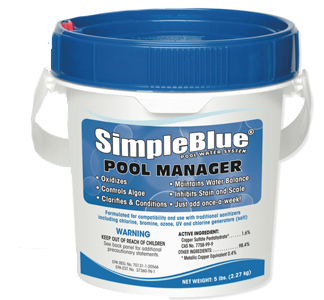 SIMPLE BLUE POOL WATER MANAGER’s multitasking blend works with the chlorine generator to provide balanced, crystal clear, algae free water all season long! • Enhances water quality: SIMPLE BLUE oxidizes contaminants, maintains water balance and prevents algae. • Extends chlorine generator life: SIMPLE BLUE reduces scale, staining, and corrosion ultimately increasing the life of pool equipment and protecting the pool surface. • Improves chlorine generator performance: SIMPLE BLUE improves generator performance resulting in increased chlorine effectiveness with less power consumption. parameters and add stabilizer to maintain 30-50 ppm based on manufacturer’s recommendation and adjust generator setting accordingly. Salt, mineral and ozone pools use 50% dosage – see application charts.